We feed our chickens well. I'm an adventurous eater, but like most people I have a few intractable aversions. And they are pretty lame. I haven't drunk a glass of milk since I was 5 and I don't think I've ever eaten an entire egg. I like the yolk of a fried or soft-boiled egg, but the white makes me skin crawl. Hard-boiled eggs are out of the question as are deviled eggs and egg salad. But worst of all: scrambled eggs. I can barely stand to watch other people eat scrambled eggs. I would as soon eat a fetal duck egg as a scrambled egg. Which is why I should never have attempted Heidi Swanson's seasonal vegetable frittata from Super Natural Every Day. I like frittata when there's so much cheese and vegetable that you can convince yourself the egg is just there to help the other ingredients coalesce This was not Swanson's seasonal vegetable frittata. I'm not sure zucchinis are in season, but they were in our CSA box, so I used zucchini as our seasonal vegetable and sliced up some potatoes. Swanson calls for a mere ounce of goat or feta cheese for 10 eggs, so I doubled that, given my need to disguise the eggs. I thought it was a very handsome frittata. But while I was hungry, I was apparently not hungry enough. It was too eggy for me. At the same time, it was too full of zucchini for household scrambled egg lovers. "Not the best, Mom," said Owen. "No offense." I don't fault Swanson's recipe. I just don't have a feel for egg cookery. We fed the leftovers to the chickens, who love eggs with a disturbing ardor. Which may have something to do, though I'm not sure exactly what, with why I'm turned off by eggs. Our second favorite Heidi Swanson pasta salad. Last night, I made Swanson's tortellini salad using CSA broccoli and supermarket asparagus. It was tasty, but compared unfavorably to the orzo salad I described in a previous post, the recipe for which you can find here. Try it! 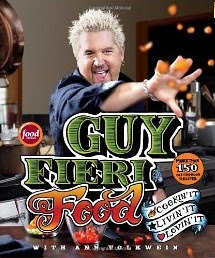 As I've mentioned, I'm going to cook from Guy Fieri Food next. It appeared in the mail and Owen has been flipping through it and folding back pages of he-man dishes like spaghetti and meatballs and pork ribs. Every day he asks me when I'm going to stop cooking from "the vegetable book." I know. But Owen has eaten a lot of tempeh and broccoli lately and I owe him. And for all the noisy graphics and dudespeak, the recipes in this book look delicious and solid. -baked oatmeal. Because Soule Mama loves it. -mostly not potato salad. Because there are CSA potatoes to use up. -carnival cookies. Because: popcorn, peanuts, bananas, chocolate chips, ground almonds. -Tutti frutti crumble. Because the picture is so beautiful. -Bran muffins. Because I have been searching for the perfect bran muffin recipe since I was 18. I wouldn't be TOO disturbed by chickens liking eggs... it's not like they're fertilized. All you get is the part of the egg that's meant to nourish a chick... so really, ideal nutrient soup for a chicken. It's sort of like a cat liking kitten food, or a grown mammal liking milk. Funny, I can take or leave eggs, but they are really having a moment, aren't they, with almost every food blogger (ok, Heidi & Deb of Smitten Kitchen) suggesting that you can throw an egg over anything to make it a meal? Wouldn't fly here, either. Not sure if the baked oatmeal is the same recipe I tried but it was a hit here, though I still love the overnight-in-the-slow-cooker technique. There also seems to be a trend toward putting a fried egg on a bacon cheeseburger. I don't get it but Chicago magazine just raved about a restaurant burger that did just that. I, too, am sicked out by scrambled eggs. I only eat them if it's more scrambled cheese with some egg. I can handle other iterations, though. I like fried eggs or hard boiled egg in salad (but not as a stand alone snack - that is disgusting). I *had* to have egg salad once, but I was pregnant at the time. I'm kind of shocked that you have all of those chickens and you (and apparently the rest of your family) don't like eggs. How many eggs do you get a week? What do you do with all of them? Azure -- Husband and son like eggs, though not with vegetables. And of course there's baking!! !